- A new feature called Raid Group Size Estimator where you key in disks values, raid type and disk type - the software will attempt to provide the best RG size values either based on NetApp recommendations or Optimal Capacity. What about deduplication? 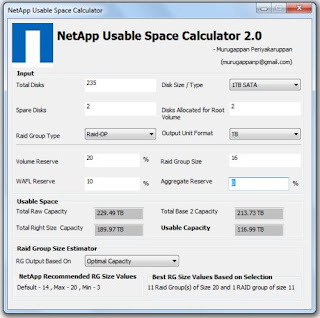 Have you looked at the inputs that NetApp uses for their sizer? I tried downloading v2.0 but Symantec A/V complains about "Trojan.Gen.2". I have sent a mail to Symantec and attached the file. Waiting for a response. Are you planning an update to include the 4TB drives? One more idea: When you use Metrocluster-/ Mirror-Setups, the usable capacity is only half of the result. It'd be great if you'd include this as well. This would be so interesting, I am planning to have a new version since I am using my old one for how many years. Thanks! New version 2.0? I like that! I wanna try that web content filter also.